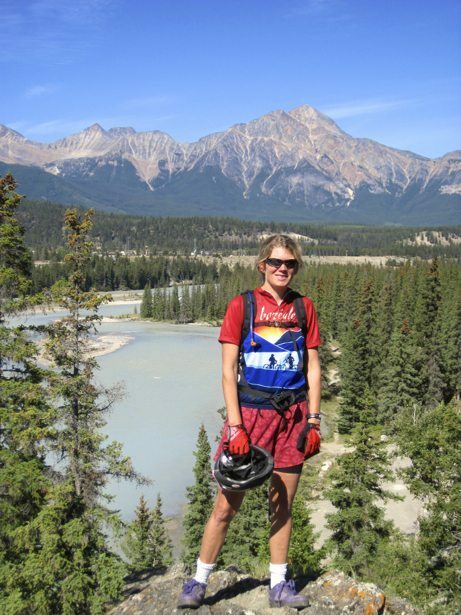 We had originally planned to head south from Prince George through the northern interior of BC to mountain bike and then check out Whistler and Squamish to see what all the noise is about. That was changed on the fly when our friends that were coming back to the Yukon from Colorado were able to pick up 2 softtop surfboards for us from Costco super cheap. We hauled out the maps shortly before leaving home and estimated that Jasper would not be too far out of our way and would be somewhat along their path. Jasper is always a great fall visit so everyone said YES and we picked Sept 10th to connect. We stayed at the Whistler Campground run by the National Park Service. It is a large campground but one of the few that is open past September 1st. Full services, very clean and very professional staff. An afternoon ride to town to check out the bike paths was just what we needed after spending all day in the truck. It was an amazing Indian Summer day – 25c, big blue skies and lots of sunshine! 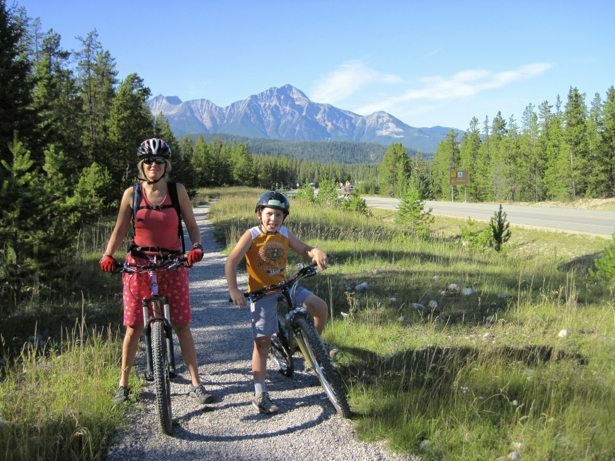 Jasper has a fabulous set of tourist oriented bike paths along the main roads and they made for easy riding, which was exactly what we needed. Boys being boys we found many sets of stairs to ride down and things to jump over just to keep the challenge going. So far so good that I am still keeping up! Using all of the learnings from Burns Lake, we were in the midst of a rocky/tricky long downhill when it dawned on me that Hunter would have to push his bike back up all of this and that maybe it wouldn’t be smarter to make it to the bottom and then make the decision. Who said we were too old to learn! Hunter worked hard and pushed his bike back up all the downhills because he was determined to ride the downhills back to the trail head. A great lesson about goals and motivation! 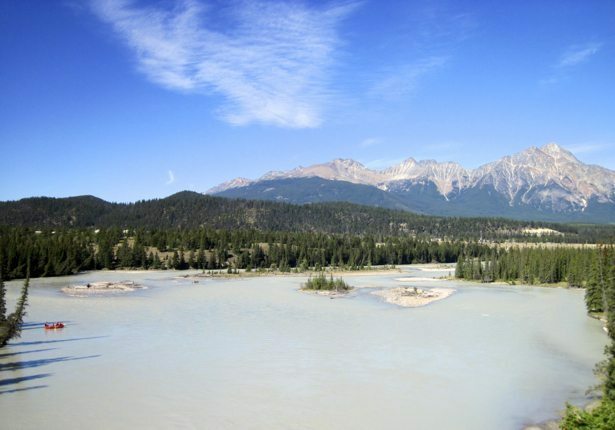 There are a series of smaller loop trails on the opposite side of the river just west of Jasper town centre and if I could do our ride over again, I would have chosen one or two of those loops taking the heat into consideration. As much as I am a hot weather person, Tim and Hunter are not and the heat just seems to drain their energy. More learnings for us as we adventure plan. 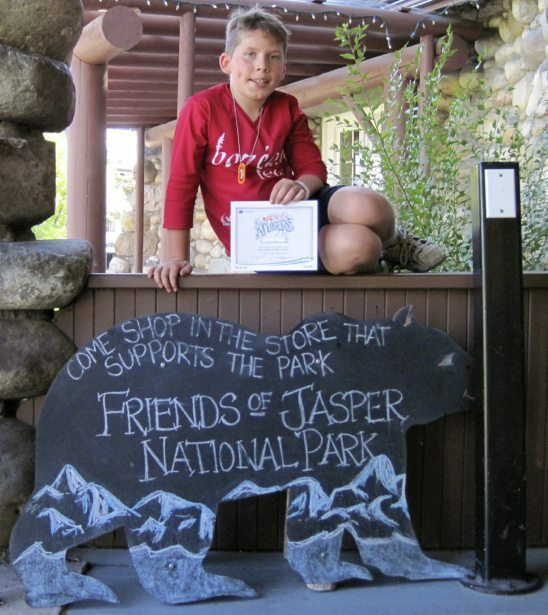 We headed back into town and hit up the Coldstone Creamery Ice Cream shop and then parked ourselves on the lawn of the Jasper Park Visitors centre to access their free WiFi and for Hunter to complete his Junior Warden book… A fabulous but quick 2 days in Jasper. Well worth the stop!